Doña Marina, ”La Malinche”, was the multilingual indigenous woman who provided to Hernán Cortés the means of communication necessary to carry Spanish conquest to the heart of 16th-century Mesoamerica. While very young she fell into the hands of Cortés and his men. Her best hope for survival was to make herself useful and agreeable, a strategy she had already learned prior to the arrival of the Spaniards on the scene. In the course of events, she asserted active common cause with the men who held her captive. For that, as La Malinche she has been punished for what seems to be all eternity. Her life experience uniquely prepared her for her role as the most effective and trusted of all the interpreters of the conquest. 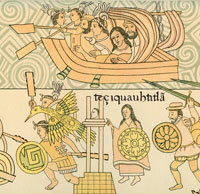 During the siege of the Aztec capital of Tenochtitlan, the Aztecs rejected the first interpreter the Spaniards sent to parley with them, and Cortés had to dispatch a boat to the city of Texcoco to fetch Marina before negotiations could go forward. Her task required both multilingualism and mastery of “lordly speech,” the complicated mode of expression used by Mesoamerican nobility. These two skills would have been uncommon in a young man, but they should have been entirely nonexistent in a young woman. 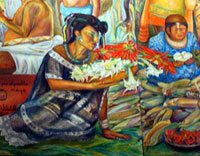 Daughters of Mesoamerican nobility lived very restricted lives. Closely guarded, they were rarely permitted to leave their residences, and they were prohibited from speaking freely. Under such circumstances, becoming a childhood bilingual was out of the question. This girl’s life was, however, atypical. As a child in an outpost between Central Mexico and the lowlands of Yucatan, she apparently was raised in a Nahuatl-speaking noble household. Then - while still very young - she somehow passed into the hands of Maya-speaking Chontal people of the neighboring region of Acalan. There she became proficient in her masters’ Maya. 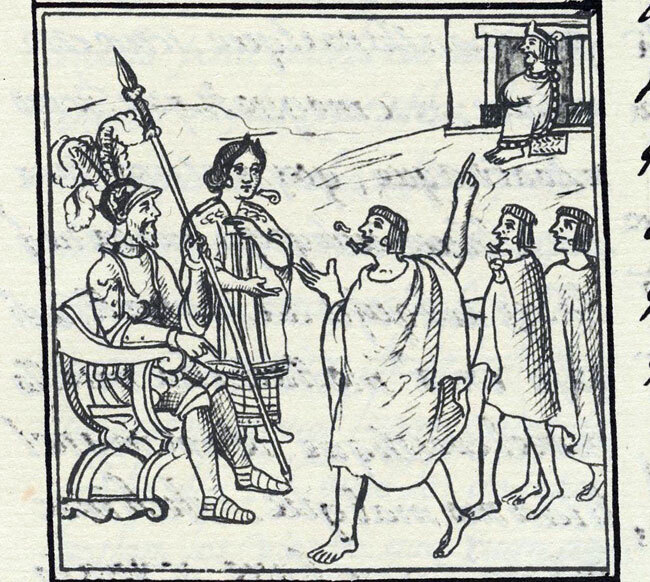 The people of Acalan in turn included her in a group of twenty young women they presented to Cortés as part of a bribe to get him to move on in search of the Aztec ruler Mote:uczo:ma and his realm. 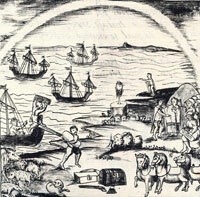 The women were said to be given to the Spaniards for the purpose of preparing their food. Cortés had them all baptized as Christians before making a gift of each of the women to one of his men. This was when Marina acquired the name we know her by. It has been said that prior to baptism, her Nahuatl calendrical name had been Mali:nalli (“bunch of grass”) and that Marina was the Spanish name closest to that in pronunciation, but this is unlikely. The Spanish name Marina would, however, have been pronounced by Nahuatl speakers as Mali:nah, and the Nahuatl honorific suffix –tzin was heard and pronounced by Spanish speakers as –che, so by back-formation, Nahuatl Mali:ntzin (from Spanish Marina) returned to Spanish as Malinche. 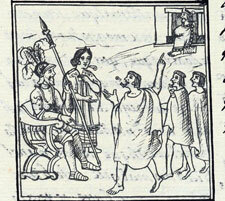 At the outset, when she was baptized, Cortés did not know that Marina spoke anything but the Acalan variety of Maya. Shortly afterward, he learned that she could interpret between Maya speakers and Nahuatl speakers. He immediately took her back from Alonso Hernández de Puertocarrero, the man to whom he had given her, and set her to work as part of an interpreting chain. 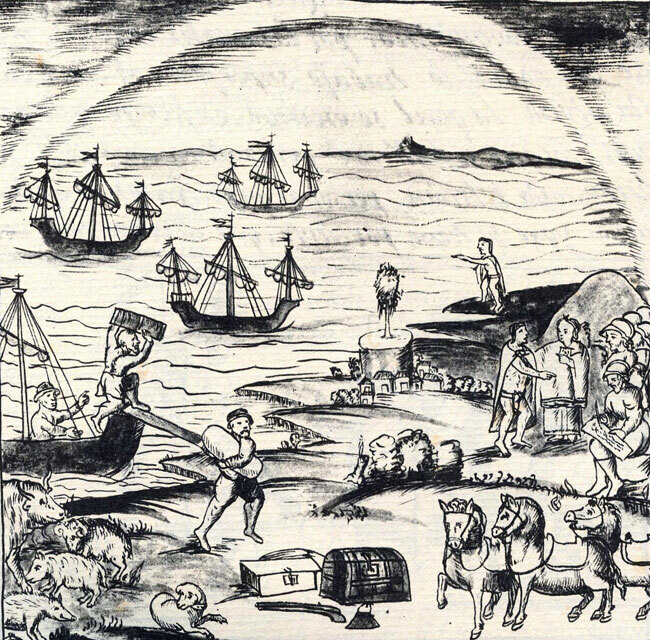 Marina spoke to Nahuatl-speaking emissaries sent by Mote:uczo:ma and translated what they told her to Jerónimo de Aguilar, a Spaniard who had learned Maya while a cast-away from a shipwreck on the Yucatan coast. Aguilar then translated from the Maya to Spanish for Cortés. This two-step interpretation continued for a while, but apparently Marina quickly acquired Spanish, and thereafter she served as sole personal interpreter for Cortés. 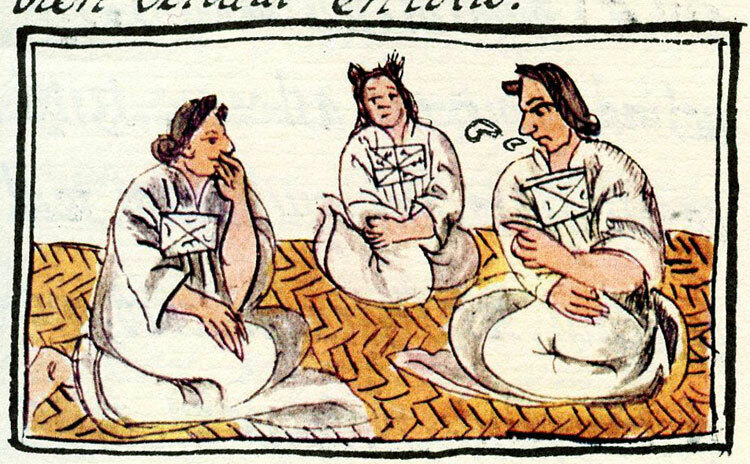 Nahuatl speakers apparently associated no prior meaning to “Mali:ntzin,” and according to Díaz del Castillo, they used the word to refer both to the young indigenous woman and to Cortés (and even by extension to other Spanish men who acquired some facility in Nahuatl). 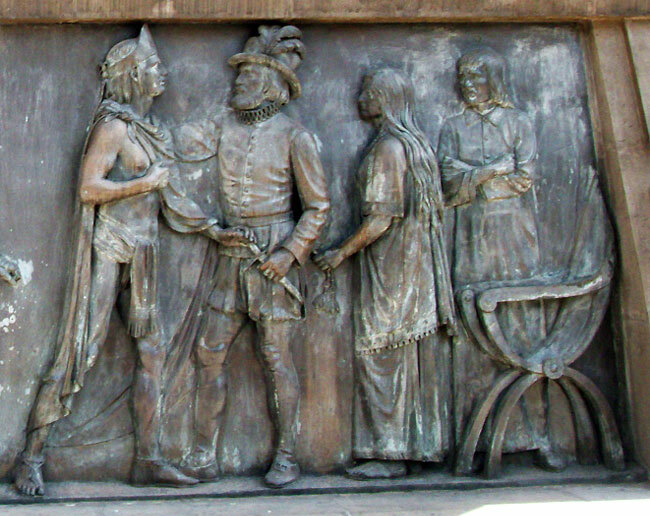 Díaz del Castillo speculated that this was because Cortés and his interpreter were always together and inseparable. 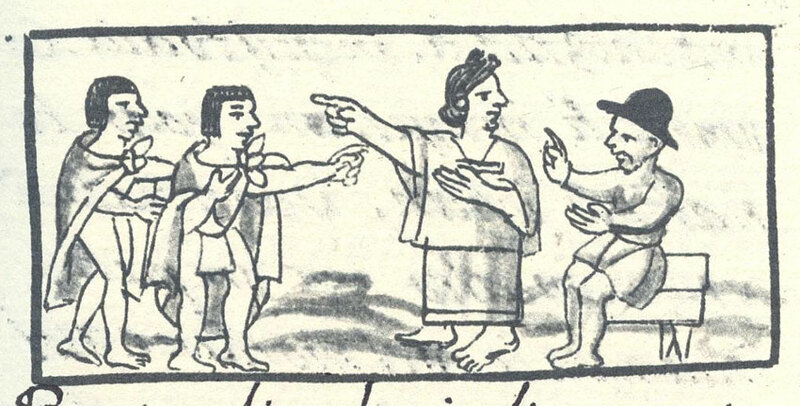 Since Aztec religious practice was pervaded by dualism and also made use of impersonators of supernatural beings, however, people who seemed (from the Spanish point of view) to refer to both Marina and Cortés as “Malinche” may have believed that “Mali:ntzin” was a single hitherto unknown supernatural being for whom both Marina and Cortés functioned as mouthpieces in the human world. 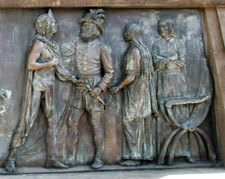 During the combat of the conquest, Marina was on hand night and day to interpret between the Spaniards and various indigenous groups. 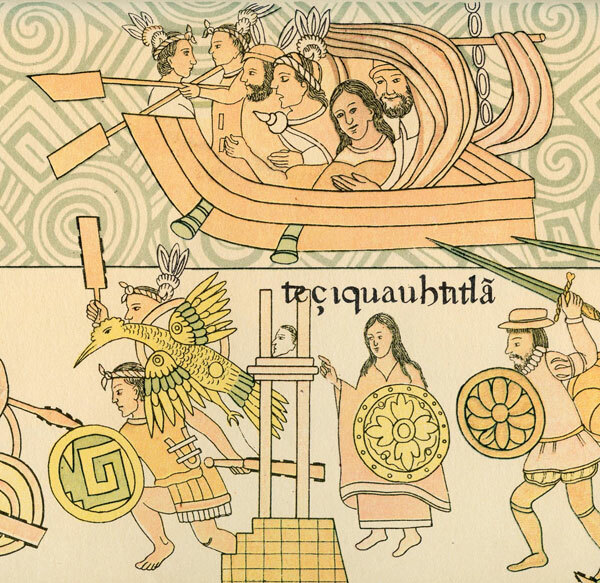 Because of the pervasive power of the Aztec Triple Alliance, if the people in question were not Nahuatl speakers, there was always an interpreter to be found to translate from their language into Nahuatl, and Marina then translated from Nahuatl into Spanish. On a campaign across the base of the Yucatan Peninsula, she translated from various regional dialects of Maya directly to Spanish. You may find Nick Pelling’s website & discussion pages in re an antique manuscript which is held by Yale University’s Boenicke Library (mss 408). Because the “Voynich” manuscript has not yet been decoded (there is NO Code), I have been translating many of the folios. I am translating the Nahuatl script into Latin/Spanish & then English. B-408 is Fray Sahagun’s diary and notes preparatory to publishing the “Florentine Codex.